if you can comprehend the imponderables. the trainer, the weather, and the post position. The whole racing world is yours to command. the imponderables ponder on despite you. The best horse stumbles at the gate. The clouds open up wetting your dry horse. imponderables that are racing. You’re the purse. they created an oddly mismatched couple. He was all sticks and stones; she all fur. They were totally incompatible sexually. He chased boys; she painted but did not show. but Lytton’s docility brought out her protective nature. She painted his rooms like the Garden of Eden. conventional biography a new, personal twist. She eventually had a few casual affairs of her own. But she always cared for her Lytton best of all. and all three lived together in a cottage in Wiltshire. The soldier pursued the painter who rejected him. but beneath that, they knew it couldn’t last. Strachey died of undiagnosed stomach cancer. Carrington followed taking her own life with a shotgun. The soldier wandered off into the mist between the wars. to be booked at the Central Police Station. but Susan refused to open her purse. he explained to the car man. I ride on the State, explained Susan. Since when does that excuse the fare? She looked at the car man indifferently. He looked at the deputy indifferently. He looked at them as they took their seats. What else was there to be done? She rides on the State, the car man grumbled. It has suddenly gotten very hot. I have no incense or mosquito net. I spent a sleepless night swatting at them. worse than the enemy planes. her class of first graders. She was in her mid-70’s. the minister, taught her the necessity of work. from Mrs. Evans rather early. and up Maple Street to her apartment. He knew where the key was located and let himself in. He found the bedroom and pushed open the door. She was always facing the wall and never acknowledged him. He lifted the bed sheets and gave her a shot of Vitamin B 12. If she had money to give him, she left it on the bed stand. that she gave them some of the best education they ever received. Copyright 2009, Gary Lehmann. © This work is protected under the U.S. copyright laws. It may not be reproduced, reprinted, reused, or altered without the expressed written permission of the author. 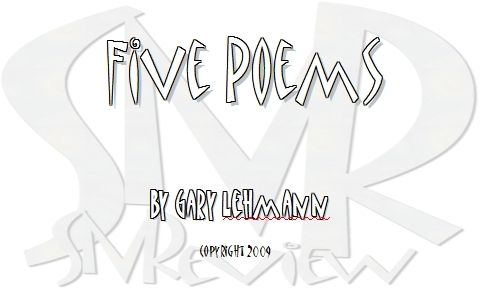 Gary Lehmann is a writer, playwright and poet whose poems have been twice nominated for the Pushcart Prize. His poem “Reporting from Fallujah” was nominated for 2006, and his poem “First in Flight” was nominated for 2007. His three act play "Susan B," about Susan B. Anthony's role in the suffrage movement in the 19th Century has been produced three times in Rochester. He is the director of the Athenaeum Poetry Group and editor of the group’s first chapbook, Poetic Visions. He is co-author and editor of a book of poetry entitled The Span I Will Cross [Process Press, 2004] which anthologizes poems of the poetry group, Five in the Afternoon. He is author of a book of poetry, entitled Public Lives and Private Secrets [Foothills Press, 2005] featuring poems on the private lives of famous people. His short play, “My Health Care Worker Stole My Jewelry” was selected for professional production in January 2006 by Geva Theatre, Rochester, NY. His second book of poetry, American Sponsored Torture was released by Foothills Press in May 2007. It explores the moral implications of the American decision to accept torture as a means of gathering information. He regularly publishes over 100 articles per year. Visit his website at www.garylehmann.blogspot.com .